I have to say, I really like e-paper. And it’s come a long way since the crude early Kindles — nowadays you have e-readers that are as high-resolution as the best phones and iPads. And they’re set to get even better if E Ink’s latest screens make it into a few products, as I hope they do. It’s Display Week in LA, which is exactly what it sounds like: All the display makers get together and admire each other’s displays. This year there’s no doubt a lot of talk around the water cooler about OLED, but E Ink isn’t letting that get to them. The company is showing off a few new screen types, collaborations with Japan Display Inc., that put to shame the best e-readers on the market today. Just so we’re clear, I’m talking about the fabulous Aura One and the Kindle Oasis, both of which have a display density of about 300 pixels per inch. 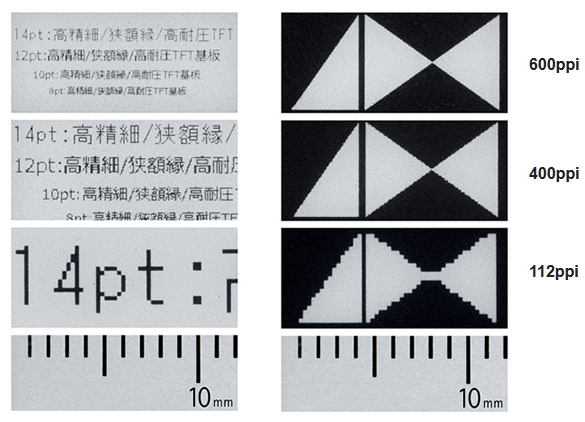 What would you say if I told you E Ink was showing off a display that’s… 400 PPI? Would you be impressed? Yes? Well then you’ll be happy to hear they’re also showing one that’s 600 PPI — twice that of its toughest competitors. You can see in that (highly magnified) picture just how much more information can be fit on a higher-PPI screen, and how much less aliased angled lines are. Really, this will make type look fantastic. Of course, its competitors are real devices and these displays are tiny strips at a trade show, but still, I get the feeling we’re going to see this tech trickle down to e-readers sooner or later.